Your Source for Custom Signage in San Diego Since 1996! With years of experience, combined with state-of-the-art signage equipment, we are fully capable of handling all of your sign and lettering needs. From large scale corporate projects to small-scale custom flags, magnets, and vinyl lettering. We can help you with your logo design and everything in between. Let Moxie Creative Inc. be your one-stop shop for everything sign related. We’ve been in business for years and have the clientele, shop, installers, and experience to back it up. 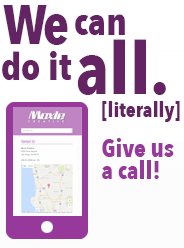 Moxie Creative Inc. is located in San Diego, California. Our company has been in business for over 22 years. We are proud of our dynamic clientele and the work that we produce. Let us help you with all of your graphics needs.